I was sent on an all expense paid trip to L.A. to attend this press junket, interview these men, and promote Marvel’s new Ant-Man. 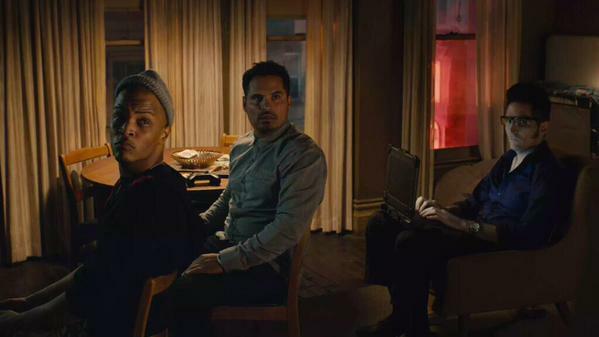 While I was in L.A. for the Ant-Man press junket I had the opportunity to interview Michael Pena, T.I. & David Dastmalchian. These three guys play Scott Lang’s (Paul Rudd’s character) friends. There were is entourage so to speak, and this is where the creative name “ANTourage” came from. This was the craziest interview I have ever been a part of in my career. First of all there was TONS of talent walking in the room all at once! There was so much synergy and comedy coming from these guys, that as they walk into an interview with all “mommy bloggers” it is amazing how much fun they had with us! 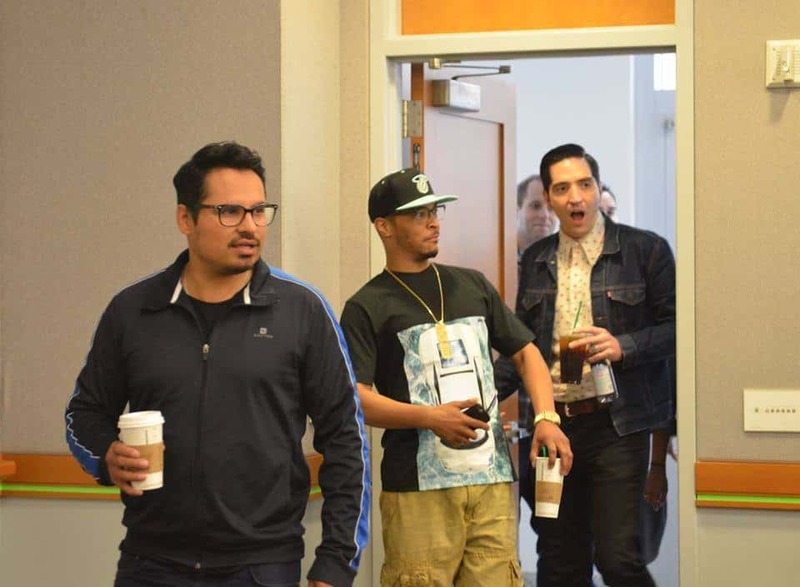 This is the best photo of the Antourage entering the conference room with about 25 moms! Micheal Pena asked that we hashtag #ANTourage, “let’s make it stick! Alright put it out there.” So that is what our group of 25 bloggers have done. We haven’t called these guys anything but the “ANTourage”! It was Michael who had un playing with toys the entire interview. One of my favorite parts of the interview was when T.I. discussed his kids being jaded and not knowing who Ant-Man was. They were excited he was going to be in a superhero movie but then had no clue who “Ant-Man” was. “You’re going to be in the Avengers! ?” his kids asked. As T.I. explained the dialogue between him and his kids it was hilarious! T.I. about getting the part — He talked about how he was sent in a hurry to read for the part. They gave him a bunch of anonymous scenes and then started rearranging his schedule so he can be in it! We also talked about how busy T.I.’s schedule was being a rapper and having to film. The men talked about how crazy it would be that he would have to fly out to Africa and then come back the morning of just to film the parts. We asked how these gentlemen got into this project. David answered with the fact that he auditioned for the part in January 2014. He mentions, “it is different than anything I’ve gotten to do before. And my immediate goal was like I am a huge comic geek! I’ve loved comics my whole life. I want something that my mom can go to the cinema and watch and not be terrified because I tend to play some goofy guys. So I went after it and I created a voice and the character and then she liked it…” Then when he got the part, his manager called him and said, “Great news. You’re going to Atlanta to test.” When he arrived in Atlanta, he didn’t realize that he actually got the part and was headed to Atlanta to star working! Can you find me in this picture? I am right next to T.I.! 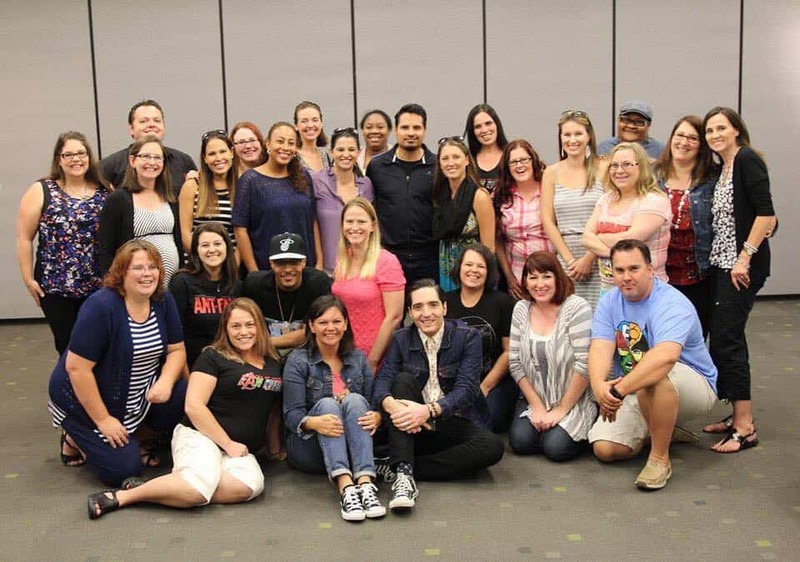 David Dastmalchian – Difference between a Marvel movie and playing in a DC film? Our interview was crazy. There were 3 men and 25 women. There was tons of laughing and a lot of overlapping statements and comedic humor. 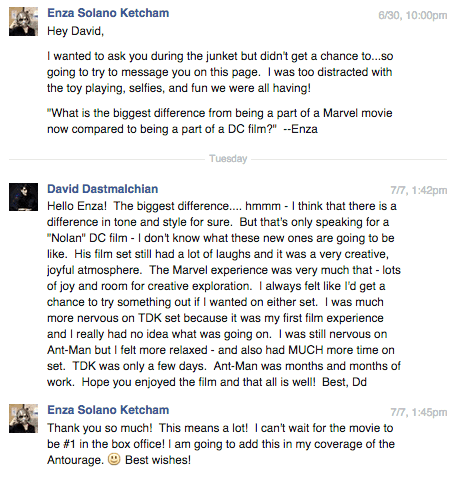 I was dying to ask David what the major difference once between playing in a DC movie and playing in a Marvel movie! We ran out of time so I did like any reporter would do, and I tried to seek the answer myself. So I decided to message David on facebook since he is so active on social media. He did respond and I am forever grateful that a successful actor would still interact with his fans! Be sure to go and see Marvel’s NEW next BIG (or really really small) THING on July 17, 2015! The next evolution of the Marvel Cinematic Universe brings a founding member of The Avengers to the big screen for the first time with Marvel Studios’ “Ant-Man” when master thief Scott Lang must embrace his inner hero and help his mentor, Dr. Hank Pym, protect the secret behind his spectacular Ant-Man suit from a new generation of towering threats.